A ToolPalette is created with a call to ToolPalette. ToolItems cannot be added directly to a ToolPalette - instead they are added to a ToolItemGroup which can than be added to a ToolPalette. To add a ToolItemGroup to a ToolPalette, use add. The easiest way to use drag and drop with ToolPalette is to call add_drag_dest with the desired drag source palette and the desired drag target widget. Then get_drag_item can be used to get the dragged item in the drag_data_received signal handler of the drag target. 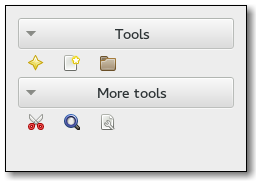 The size of the icons in a tool palette. Is true if the icon_size property has been set. Sets this as drag source (see set_drag_source) and sets widget as a drag destination for drags from this. Get the dragged item from the selection. Gets the item at position (x, y). Gets whether group is exclusive or not. Gets whether group should be given extra space. Gets the position of group in this as index. Gets the size of icons in the tool palette. Sets the tool palette as a drag source. Sets whether the group should be exclusive or not. Sets the position of the group as an index of the tool palette. Unsets the tool palette icon size set with set_icon_size, so that user preferences will be used to determine the icon size.